It’s my favorite time of year in Arlington. This is when the stadium pulls up the trademark turf and puts down at least one hundred truckloads of dirt – for the best of reasons. Here’s the four annual sports that take place on dirt, and why it’s one of the best months in Arlington for entertainment. 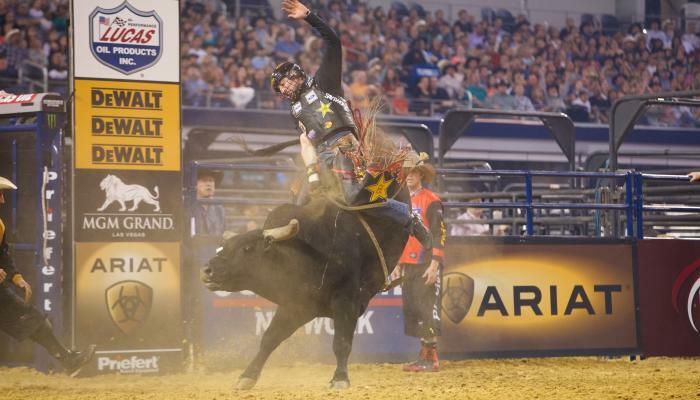 For the first time on US soil, PBR has brought its Global Cup to AT&T Stadium February 8 and 9. Bringing together teams, instead of individual riders, assigned by country and competing for national pride and global dominance in bull riding. Watch Team USA battle Team Brazil, Team Mexico, Team Canada, Team Australia and for the first time, USA will have a second team, the Team USA Wolves, who will be the first ever Native American sports team, making sports history. Plus, riding teams will be competing for their share of the $750,000 purse. It’s truly an event to see, and we’re so excited that this international event has made AT&T Stadium in Arlington its home. There are still tickets left, and until 11:59 pm tomorrow 2/8, use promo code ARLINGTON for 50% select seats – it makes tickets as low as $5 each! Get tickets here. Experience the most competitive and highest-profile off-road motorcycle racing championship in the world February 16 at the Monster Energy AMA Supercross, an FIM World Championship. Tickets are on sale now at SeatGeek.com. Wild tricks and high-octane drivers like the iconic Grave Digger! See monster trucks spin out, conquer massive mounds of dirt, do a complete vertical flip and more. 2019&apos;s Monster Jam will be a feat of non-stop action on dirt! For tickets, click here. The American returns to AT&T Stadium as a two-day event, as it remains the World&apos;s Richest Weekend in Western Sports! Two new events, including BreakAway Roping and a #9 Team Roping have been added for 2019. The American will be held on March 2-3, 2019 with final qualification rounds on Saturday March 2, 2019 and the finals round on Sunday, March 3, 2019. For tickets, click here. Click here to book your hotel in Arlington.